A book, apparently containing heroic songs, mentioned twice in the Old Testament: in the account of the battle of Gibeon a fragment of a song of Joshua is given as taken from it (Josh. x. 13); and another fragment is quoted in David's lamentation for Saul and Jonathan (II Sam. i. 18). The nature of this book has been a matter of discussion from the time of the Septuagint up to the present day. The Septuagint, in Joshua, omits all reference to the Book of Jasher, while in II Samuel it refers to it as Βιβλίον τοῦ Εθοῦς. On the other hand, in I Kings viii., transposing verses 12-13, which are a fragment of a song, after verse 53, it adds, "is it not written in the book of songs (ἐν βιβλίῳ της ῳδῆς)?" It is evident that the Septuagint had a text which in this passage read ; and it may be supposed that the word , which occurs in the two passages mentioned above, is simply an anagram of . This supposition is supported by the Peshiṭta, which reads in II Samuel "Sefer Ashir," while in Joshua it translates "Sefer ha-Yashar" by "Sifra de-Tushbeḥata" (= "Book of Praises"). Another theory is that "Sefer ha-Yashar" is a misreading for "Sefer Az Yashir" ( ; comp. Ex. xv. 1), the book beginning with this phrase, and containing songs. 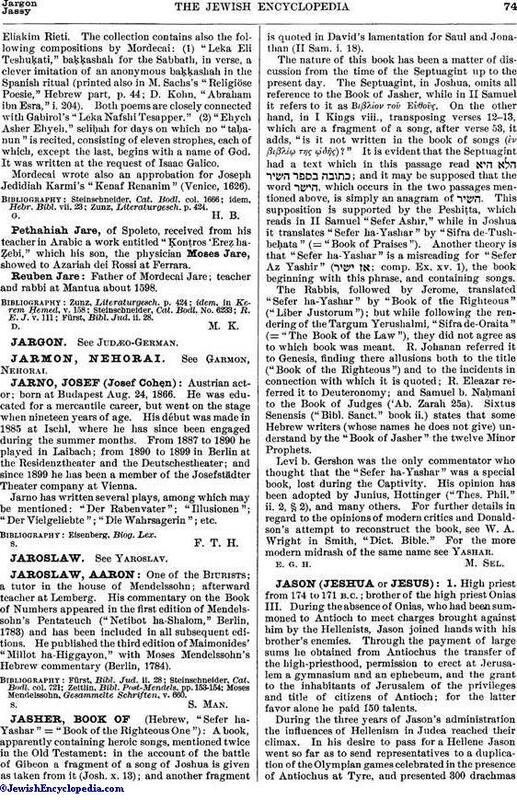 The Rabbis, followed by Jerome, translated "Sefer ha-Yashar" by "Book of the Righteous" ("Liber Justorum"); but while following the rendering of the Targum Yerushalmi, "Sifra de-Oraita" (= "The Book of the Law"), they did not agree as to which book was meant. R. Johanan referred it to Genesis, finding there allusions both to the title ("Book of the Righteous") and to the incidents in connection with which it is quoted; R. Eleazar referred it to Deuteronomy; and Samuel b. Naḥmani to the Book of Judges ('Ab. Zarah 25a). Sixtus Senensis ("Bibl. Sanct." book ii.) states that some Hebrew writers (whose names he does not give) understand by the "Book of Jasher" the twelve Minor Prophets. Levi b. Gershon was the only commentator who thought that the "Sefer ha-Yashar" was a special book, lost during the Captivity. His opinion has been adopted by Junius, Hottinger ("Thes. Phil." ii. 2, § 2), and many others. For further details in regard to the opinions of modern critics and Donaldson's attempt to reconstruct the book, see W. A. Wright in Smith, "Dict. Bible." For the more modern midrash of the same name see Yashar.